Download this Q&A for printing in PDF format. How has our situation changed as we go into these contract negotiations? Through our unity, we’ve been able to fight off cuts in the past and protect our schools from some of the most aggressive schemes cooked up by Rahm and his billionaire friends. Ten years ago, the public largely accepted the ideas the mayor had put forward. Today, the public has embraced our analysis. Parents and the public at large overwhelmingly support us on the need to invest in our schools, on class size, on closings, and against over-testing. Thanks to advocacy by our members and allies, CPS finances are more stable and we don’t face the same level of financial crisis as in our last round of contract negotiations. We have a chance to move from merely defending what we can into pushing our agenda forward to make our schools better. We need to focus on our priority list of demands that can transform our schools and convince people that we can win them. 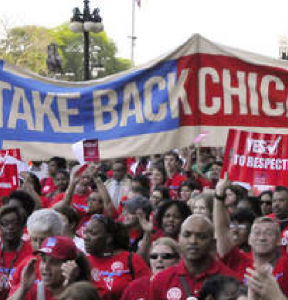 How can CTU win what Chicago’s educators and students deserve? We have to be ready to strike in September—no matter who is mayor. We have come a long way, but there are still powerful forces lined up against us, our schools and our communities. Even with a friendlier mayor in office, there will be huge pressures to cut budgets, weaken our schools and attack our union. If we want to win, we may not have to strike, but we must be ready in the fall. What are our key demands for the next contract? Educators in our district have been frozen, furloughed, fee-hiked and forced to work with staff shortages in every area. Today, CPS has stronger economic support, due in part to the work that CTU members and staff have done in advocating for fair funding. CPS needs to stop short-changing the people who make our schools work. CTU will not accept excuses for continued neglect of teacher, clinician and PSRP pay and benefits. Counselors, nurses, librarians, social workers, teacher assistants, student and family paraprofessional support—you name it, CPS has been ripping off our students by not hiring or retaining the licensed, certified and unionized staff they need. We will not tolerate the continued elimination of positions like essential school librarians, certified school nurses or special education teachers. We will fight for staffing commitments in all the areas that impact children’s readiness to learn. Our students need individual attention from their teachers. We cannot provide that level of attention when we have over 40 students in a kindergarten or an upper grade class. Since 1995, state law has given the district the upper hand in class size negotiations. Now, with solid, enforceable class size language emerging in our newly won charter school contracts, we are stronger than ever in fighting for this key demand. Student learning doesn’t just depend on what happens inside the classroom. CTU will fight for social justice for our students and their families with demands in the following areas. Rahm’s development plans keep pushing rents sky high. Lack of affordable housing is leading to pushout from the city. That has led to declining student enrollment—especially among Black families. In Chicago and throughout the country, students have been criminalized more and more each year. From the threat of ICE raids on students and families to the disproportionate calls to police for Black students to a gang database that unfairly labels our students without due process or recourse, all our students need sanctuary. We’ll fight for our schools to protect our communities and to be places where kids can be kids—safely and without biased stigmatization. In the 2015 contract, we bargained for and won a Sustainable Community Schools pilot program. The program paired twenty schools with community partners to provide the kind of wrap-around supports that students in high-risk communities need for success. We will fight to broaden this program to at least 75 schools, so that our students have their social and health needs met and can focus on learning. Although CPS claims to support restorative practices to resolve student issues, the truth is that this has become an excuse to ignore problems kids face and sometimes cause. In order to truly practice restorative justice, schools need staff to coordinate that work and provide the time and energy for more than just band-aid “solutions” to their problems. What do members need to do to build our power? All of our work from now to September should help us lead a strong contract campaign. Along with our ongoing efforts to enforce our existing contract, our school level fights, and our work to elect candidates who reflect the needs of our schools and communities, we need to highlight our ideas for how to win the schools Chicago’s students deserve. We need strong union structures in our buildings (PPC, PPLC, Contract Action Team) which can reach out to parents, students and community about what we want to win. By winning fights to enforce the contract we can make these needs visible and gain school-level improvements now. This will help get the public on our side while building our own morale, confidence, and strength. How will this bargaining process go? Now that CTU’s members have weighed in on our demands and our House of Delegates has ratified the specific language we will bring to the bargaining table (available to all members in our MemberLink Portal), negotiations can begin in earnest. Although the negotiation calendar can’t be predicted down to the day, we anticipate the following general timeline. CTU will present our demand language to the Board to make our position clear. Members can read our exact proposed language by logging into our MemberLink Portal. Our members form Contract Action Teams (CATs) and engage in activities to rally support for our demands among members, parents, and students. If no agreement has been reached, CTU will push for the fact-finding segment of bargaining to begin. CTU members will be ready to take action if there is no agreement. What should we expect from the new mayor? We sincerely hope that the new mayor will be committed to improving our public schools. That’s why we voted to endorse Toni Preckwinkle. That endorsement was driven by her commitment to an elected, representative school board, a moratorium on school closures, an end to charter expansion, and progressive new revenue to adequately support neighborhood public schools that can truly function as sustainable community schools. But whoever the mayor is—even if it is Toni Preckwinkle—we are prepared to do what it takes to win improvements for our schools. That includes the possibility of a strike this fall. Will there be a strike this fall? Across the country, teachers and other educators have gone on strike to stand up to cuts, privatization and inadequate pay. 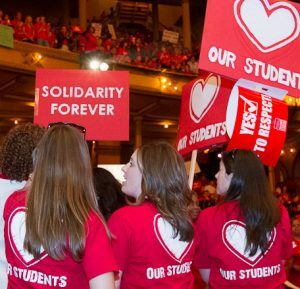 The #RedForEd movement was both inspired by CTU members who struck in 2012 and has inspired us to fight even harder for students and educators in our district. If CPS does not offer us a just contract, a strike is a strong possibility. How realistic is it that we’ll win these expensive demands? No doubt, the schools our students deserve and the compensation our members deserve add up to a significant increase in district spending. The price tag on our demands may be in excess of $1 billion. That is truly a large sum, but consider that this city continually comes up with funding for every corporate giveaway imaginable. Remember that the mayor offered more than $2 billion to Amazon. Now he’s pushing plans to subsidize Lincoln Yards with $1 billion in tax dollars. Given all that largesse, why shouldn’t our students—our future—get a similar investment?